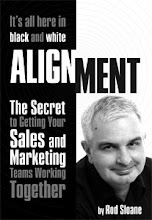 Sales and Marketing Alignment Blog from Rod Sloane: Are you worth talking about? We live in a commodity based, reality TV, homogeneous world. Everything is the same, everyone looks the same. Crikey, even all the stand up comedians now wear smart suits. What stands out anymore? What is worth making a remark about? Are you worth making a remark about? Are you remarkable? Is this blog worth talking about? Well, it’s not what you do; it’s the way that you do it! Hey, maybe there’s a song title in there somewhere. I can ask a gazillion people to create a new website for me, the world is full of smart accountants and I can receive SEO tips anywhere, anytime and anyplace. Think “How am I different?” If you want to be talked about, that is?